Almost every customer welcomed the optimum cushioning given by the Altra Escalante. The runners liked how soft the shoe’s upper felt against their skin. Many users were impressed with the deliberate build of the shoe, as well as its durability. A few runners commented on the straightforward construction of the upper unit; it apparently offered excellent comfort at a low weight-profile. Some admired the wide toe-box since it prevented uncomfortable rubbing of the forefoot against the shoe. For most users, the shoe fits true to size. One of the runners commented how well the outsole performed on the asphalt. A few users described their experience with this running shoe as being ‘springy in the most amazing way’. The Escalante managed to convert a good number of devotees of other brands to Altra. A runner mentioned how the pair started to cause blisters after 200 miles. Several consumers reported that the toe-box height was very low and that the tops of their toes rubbed against the upper fabric. One purchaser complained that he felt ‘major knee and ankle pains’ after running in the Escalante. A number of people felt that the sizing was bigger than what they were used to. A good number of consumers were happy with the Altra Escalante. Many of them praised the cushioning system, its apparently soft upper unit and its general durability. But there were those who complained about the inconsistent sizing scheme, as well as the discomfort that they felt from using this shoe. Overall, the response for this running shoe was mixed-to-positive. I have been a fan of Altra for some time. I transitioned to a zero drop shoe last year and found that I am less prone to injury since. I am a neutral runner with a midfoot strike, about 165 pounds and 6’ 1” tall. I race all distances, from 5ks to marathons, but spend at least half of my year training for an upcoming marathon. This year, as my birthday drew near, the Altra Escalante was just making headlines. I was in need of a good trainer, as my 22-week marathon training would soon begin, so my wife got me a pair for my 41st birthday. They have turned out to be a GREAT gift! I hope to get up to 750 miles on my running shoes. I know that is probably not realistic, but that’s what I expect from my investment. So far, I have not reached that level with any shoe. 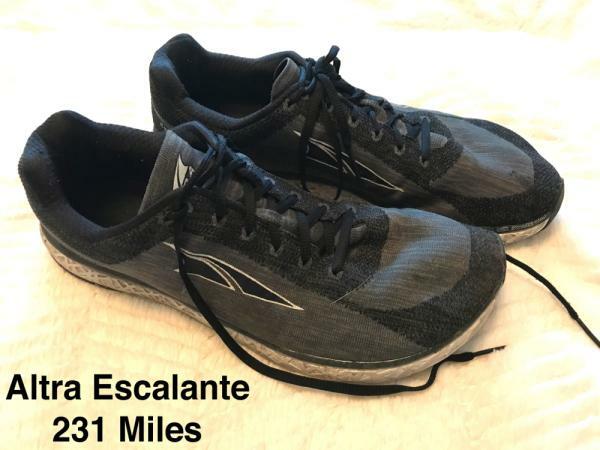 With my Altra Escalante running shoes, I have surpassed the 200-mile mark, and here is what I have found. I run at least 6 days a week and rotate through at least 5 pairs of shoes, but I look forward to sliding these shoes on my feet more than ANY OTHER shoes I wear. Personal admission: I’m pretty tough on shoes. Shoes are made to be worn, and I wear them out! I’ve already seen some odd wear and tear across the Escalantes. As a mid-foot striker, it seems that my mid-foot is located at the wrong point on this shoe. That being said, I see nothing at this point that would make me think they won’t last for a good while longer. While I have run in the Escalante on a variety of surfaces – from asphalt to concrete, and from dirt trails to compact sand – I mostly run on streets and sidewalks that need repaving desperately. I have noticed while running in the Escalante, that when I step on cracks or uneven surfaces, my foot will easily twist, following the contour of the ground. At this point, I have not been injured, but it is very clear to me that anyone who runs in the Escalante should make sure the running surface is as smooth as possible. I love the springiness I’ve found in the Escalante. When I run in them, it seems like my feet only touch the ground for a millisecond before the shoe propels my feet up again. I use the Escalante for tempo runs and long runs with intervals, and it seems to be the perfect shoe. I have found that it is supportive enough for a 16-mile run and responsive enough to squeeze out 5x1 miles at half marathon pace in the middle of a 9-mile run. I love wearing the Altra Escalante and dread taking them off! I will probably buy another pair before my next marathon and run in them. The only reason I would not do that is if they don’t last as long as I need them to last. The verdict is still out on their durability for me. Having been an Altra fan from the very first Torin of the line, the brand has been a breath of fresh air in the technical running shoe community. A shoe line that embraces the zero drop and minimal concept with a full spectrum of cushioning options to help runners of all ability levels and gait patterns transition to a, “less is more” approach of running with an emphasis on gradual improvement in form and posture. race shoe but one that can be neutral toned and comfortable enough for casual wear and the daily grind at work. Here’s how it held up from my usage as a daily marathon trainer and shoe for work on my feet all day in the healthcare field. The upper is a first for Altra with a woven fabric and a very flexible feel. Combined with Altra’s signature foot-shaped toe box, this seemed like a match made in heaven for those looking for natural foot mechanics and freedom of movement. Initially, the fit felt a bit tight on the sides and low in terms of toe box depth, but after just one or two short jogs the knit upper seemed to relax considerably, especially in terms of the feel on the top of the foot. I felt like this shoe fit very true to size (I measure on a 10 and usually wear 10.5 as I chose in this model). I would caution anyone thinking about sizing up as you may end up swimming in the shoe, especially at the bridge of the foot and arch area, leaving you prone to blistering and irritation. In addition to creating a great fitting upper, the fabric and matched tongue material feels great even to the barefoot (important for those looking to transition into more minimal fare). Even the laces have a smooth feel and patterning that seem to hug the foot in all the right places through the medial arch. The heel collar of the shoe is much plusher than any other Altra I have owned and the counter is almost non-existent, which may turn off some runners looking to stabilize excessive pronation, but for the purpose of the shoe, it fits well with the concept. Most importantly, the construction of the material inside the heel collar is tough as nails. I have run in this shoe for 400+ miles and have been wearing it as a work shoe since its retirement from my running rotation 3 months ago and it is still not breaking down or developing the dreaded tunnel in the padding that I am used to seeing at the end of life from most of my shoes. This is crucial for distance runners and casual all day wearers to prevent irritation in the heel and rearfoot as the foot expands throughout the course of the day or workout. If there is one small detail in this shoe that keeps it from perfection, the Indian flaw, it would have to be the feel of the midsole and the low midsole to outsole coverage ratio. Altra debuted its new proprietary cushioning foam, the Ego, in this shoe and it does have some good points. In terms of feel out of the box, the Ego material (and a peculiarly beefy insole) have a very soft feel, and this has stayed pretty consistent over the lifespan of the shoe. It also exhibits supreme flexibility without compromising on shape retention that, when paired with a roomy and flexible upper material and last, allows for wonderfully organic foot mechanics and freedom for one’s toes important to those practicing POSE Method, Chi Running, or any other number of programs designed to bring you one step closer to greater efficiency of gait. Having said that, for a company that makes its name on responsive cushioning and feel underfoot, the Ego material feels overly mushy at times and is so pliable that the midsole material often makes contact with the ground in stance phase THROUGH the gaps in the outsole and has formed wear patterns in the midsole at the forefoot. At times (see photo below) I have even had to pick gravel or wood chips from out of the midsole after runs on B level roads and trails. For those looking for a daily trainer that like a plush and luxurious ride, this tech is worth every penny for the shoe (MSRP $130). For folks who enjoy more feedback from their stride, it is impeded considerably for the first few hundred miles in this shoe. The insole itself and the drainage system of the shoe is quite impressive despite its girth. Even on longer runs and treadmill workouts in humid conditions, the moisture ports on the bottom of the insole combined with the woven upper seemed to keep the shoe relatively dry for the short runs and damp but manageable on long-distance jaunts. Most importantly, this keeps the shoe from having that soggy feeling or squishy sensation that can turn a great workout on its head quickly. The durability of this shoe may be the best I’ve seen since the old workhorse Kayanos and Trances of yesteryear without the weight and clunkiness that accompanied them (only 8.2 oz. listed for Men's size 9). As previously mentioned, I have logged over 400 miles in this shoe and countless others roaming the halls of the facility in which I work and the cushioning, upper and outsole have kept up to the task admirably. The rubber compound grips the road and tracks well as it does carpet and tile floors, even in wet conditions. It does not perform well over grassy areas and does tend to bog down in the mud, but as a designed road shoe its versatility in that arena does have its limits. Most impressively, the shoe has seen very little wear in tread depth up to this point in the shoe. By the time most of my trainers have reached this point, there is usually an outsole pad that is coming unglued, or has worn to almost the midsole, but not with this model. In fact, the previously mentioned wear pattern showing through the midsole is much more noticeable than any wear on the outsole. For this reason, the only room for improvement would be to see better strategic coverage of outsole material placement to avoid the above-listed issues. In the same way, the woven upper (which as a general rule can be susceptible to snags, rips, and holes over time) is pristine. An added bonus that I’ve noticed is that the shoe is easy to clean despite the white sole even with the crosshatches of texture to the midsole and the woven fabric seems to hold its color and tint quite well even after hours in the sun and exposure to various fluids/staining liquids like gatorade, sweat, mud, and dirt. While this model is still a first for Altra, it clearly wins the seal of approval for versatility and style. Although previous Altra models have looked bulky and awkward at times with the foot shaped toe box and oversized midsole, this model almost feels streamlined and sporty by comparison. It also has more colorways than you can shake a stick at with special editions for Boston and Running Warehouse along with more than 6 other basic color combos ranging from neutral grays and blacks to Green Bay green and gold and special edition Hot pink with black and heather colored streaks. There is a little something for everyone looking for WOW or well-to-do. There is now even a special edition racing version for this year’s Boston Marathon as well. For those who are looking for a shoe to go out on the town in jeans and a t-shirt, then head out for a nice evening tempo run and get up in the morning ready for the workday, this shoe can really do it all. While I very rarely purchase the first model of any shoe, the Escalante has made me seriously reconsider that policy. It is by far the most durable and comfortable Altra I have ever owned and has been the most versatile shoe I’ve seen in years. I can’t wait to see the sequel. The Altra Escalante is an attractive runner that offers so much comfort; you will wish all of your shoes were Escalantes. With the selling price of $130, they feature lightweight, flexible knit uppers, 25mm stack height soles, and a flexible sole. Moreover, they are available in various attractive colors. I usually wear a size 7.5, and the Altra Escalante was no different. I felt it fit true to size. If you have never worn a zero drop shoe (where the heel height is the same as the toe height), you may have to slowly transition from your current shoe with an elevated heel, to an Altra Zero drop shoe. Otherwise, you may encounter Achilles or calf pain if you jump straight into long runs with your zero drop shoe. Switching to a zero heel to toe drop has helped with pain that I used to get in my knees on long runs. It has helped me improve my running form. The Escalante, like all of Altra’s shoes, is the shape of the natural foot with a zero heel-to-toe drop to mimic barefoot running without sacrificing comfort. If you don’t like a wide toebox, Altra is not for you. I have been wearing Altras for over 5 years and have owned more than 15 pairs. I buy them for the fit and function but don’t usually find them attractive. The Escalantes changed that. They are a good looking shoe. I used my Escalantes mainly for treadmill and road running. They had ample cushioning, and my feet felt great, perhaps even pampered. There were no hot spots, the shoes are absolutely seamless. The engineered knit fabric allowed for good breathability and flexibility giving the upper a sock-like feel. It was like running on clouds, or in your coziest slippers. The sole was soft and flexible to allow a natural stride. The Altra Escalante was designed for road running, and that is where they shine. The Escalante is so comfortable that I also have a pair I wear to work where I am on my feet all day. I get about 10000 steps in a shift at the hospital, and the Escalantes save my feet so that I can still enjoy a nice 10km run when I get home. Corns? Bunions? Blisters? Just want a comfortable runner that looks good? Try the Altra Escalante. If I could only wear one shoe for the rest of my life, it would be these shoes. The soft, stretchy, sock-like fabric that makes these so attractive and comfortable also allowed my toes to poke through the end within the first six weeks of wearing them. For the price of this shoe, I would have appreciated some toe reinforcement to prevent this from happening. My husband had the same problem with his toes poking through within the first couple of months. His Escalantes also started to separate on the bottom of the sole. I love this shoe. I recommended it to my father who was experiencing a lot of pain from bunions and he loved them also. He said they were the most comfortable shoe he has ever worn, and I have to agree. With some toe reinforcement to prevent that awful hole at the big toe, these shoes would be perfect. So close Altra! So close! Overall, I would run a marathon in this shoe, I would run a half-marathon in this shoe. I would have a lot of fun in this shoe. The fully-cushioned Zero DropTM platform and the FootShapeTM toe-box work together symbiotically for an enhanced cushioning and efficient adaptability to changing foot movements. The Altra EGOTM and the InnerFLEXTM layer in the midsole are responsible for the impressively softer feel and an advanced cushioning experience users have in the Altra Escalante. The FootPodTM technology further improves the shoe’s flexibility through its strategic metatarsal mapping. The Altra Escalante has a standard running length and comes in the standard medium width of D and B for men and women, respectively. Also, its decidedly wider toe-box makes it suitable for runners with wide feet and those who just want natural toe-splay to be accommodated. The Altra Escalante utilizes the FootPodTM technology in its outsole for efficient mapping of bones and the runner’s foot-tendons. This technology, which is also used in the Escalante 1.5, results in an increased natural flexibility and responsive movement. The fully-cushioned Zero DropTM midsole is an optimal combination of soft cushioning and light weight. It ensures weight balance from the heel to the forefoot region, thereby allowing the runner to perform more efficiently on the roads. The Altra EGOTM provides the kind of cushioning that wins the hearts and minds of people in no time. This durable and soft material provides a responsive and springy underfoot experience. The InnerFLEXTM enables the shoe to adapt itself to the shape of the foot for better flexibility and efficient movement during long distances. The Engineered Mesh is a lightweight material that has a construction that’s similar to woven cloth. It’s flexible and soft. So, not only is the coverage breathable, but also smartly designed to give agreeable fit and flexibility during runs. This Altra running shoe uses the FootShapeTM toe-box which lets the user’s feet relax and spread out in a manner that is both natural and potentially comfortable. The padded collar locks the heel in place and prevents the foot from exiting the shoe accidentally. A traditional lacing system helps the upper in wrapping around the foot securely.